New Orleans is famous for its music, so much so that the city’s name is almost synonymous with the word jazz. Other music, like Zydeco, thrives in Creole country of Southern Louisiana, while Bounce sprang up in the late 1980s. The styles of music are distinctly different, but one commonality binds them all -- when listening to them, the body takes over, and soon enough, feet are moving, and torsos are rotating. 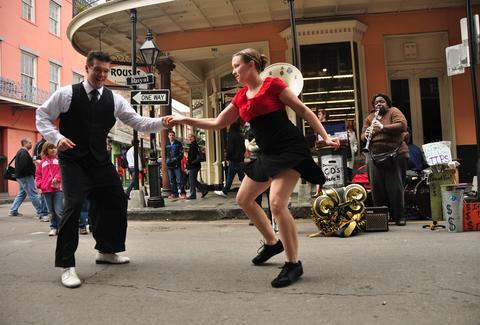 “You can tell who is from Louisiana, because if we hear the drop of a beat, and it sounds like it comes from us, we’re all going to respond with some kind of swing from our body,” said Marissa “Moe Joe” Joseph, local dancer, teacher, and culture entrepreneur. The city’s music and dance found their origins with Afro-Caribbean slaves, whose rhythms and rituals were so powerful that they withstood oppression. What started as African dance turned into jazz, which evolved into many other participatory, celebratory, and improvisational dance forms. The city continues to have an influx of immigrants from around the world, with each culture bringing its own style of dances that are embraced by New Orleans’ renowned hospitality. Zydeco developed among the French Creoles in southwestern Louisiana -- a fast-tempoed music based on accordion and washboard that is danced with a two-step. Thursday Zydeco nights at the Rock 'n’ Bowl are a thing of legend. Come with a partner or find one at the venue as you get deep into Louisiana culture while listening to the rhythms of French Creole and French Cajun Zydeco bands. Bounce, New Orleans’ alternative take on hip-hop, grew in the 1980s with each of the city’s 17 wards having its own style and recognizable lyrics. Characteristic of Bounce music are the call-and-response direction, where the dance move is shouted out and the dancers respond. Bounce dance has become increasingly popular -- the most popular move being the twerk -- and Beyoncé’s Formation music video even features NOLA Queen of Twerk, Big Freedia. Head to Dancing Grounds and be prepared to twerk to some sick beats. Class packages and memberships start at $39 per month; new students can pay $33 for one month of unlimited classes. At the turn of the last century, Storyville was famous for its vibrant jazz scene and scandalous burlesque shows (as well as prostitution and crime, but we’re keeping it classy here). Today, the burlesque scene is one of the best in the country and going to watch a New Orleans Burlesque show is an absolutely must. But if during that show you find yourself imagining your own routine and outfit, fear not, the NOLA School of Burlesque will teach you all the sultry and comical moves your heart could ever desire. Dancing in the streets of New Orleans is part of the NOLA lifestyle, and the history of second line goes back to ceremonies and rites in Africa. Get your dance on in an organized (and slightly less spontaneous) way by joining a flash mob, specifically DatFlashMob! 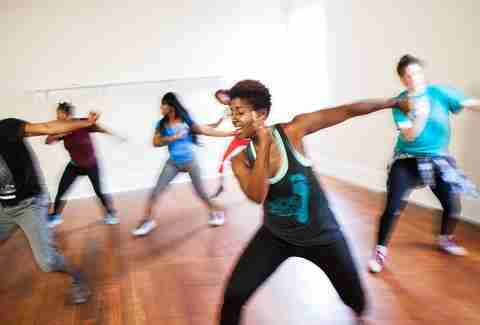 Taught by Marissa “Moe Joe” Joseph at Broadmoor Arts and Wellness on Tuesdays at 8pm. 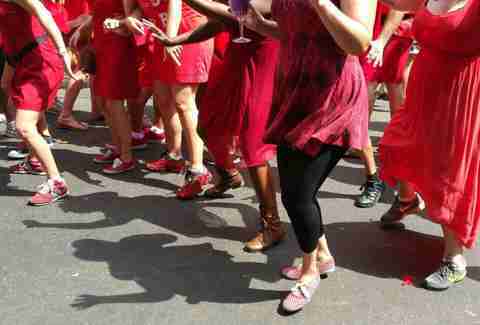 To be sure you don’t fall out of step, Dat Flashmob offers weekly choreography practice leading up to a 30-minute performance. Taking a spin on the traditional jazz dance, the New Orleans Jazz National Historical Park offers an array of fitness classes including jazz pilates (Wednesdays 4 - 4:45pm), taught by eminent singer Stephanie Jordan, jazz bounce aerobics (Thursday 4 - 4:45 pm) with Ranger Chandra Teddleton, and even jazz yoga with live accompaniment by Peter Nu on Saturday mornings from 10 - 11am. Classes are currently held at the Old US Mint (400 Esplanade Ave.), but will be relocating in January 2017 to 916 N. Peters. Another historically New Orleans tradition, the pole dancing trend continues to buzz and grow in popularity. Beyond drawing out your inner vixen, pole dancing has many health benefits: balance, flexibility, core workout, relaxation... the list goes on and on! The Body in Motion studio has a cool vibe with mood lighting and seven floor-to-ceiling poles. Spinning, flipping upside down, and climbing are euphoric movements that we often leave behind when we grow up. Fortunately, aerial arts for grownups have become a popular workout, giving big kids the opportunity to feel like they can fly. But it isn’t all fun and games, as this class is an intense workout, so bring some high-energy and a big bottle of water. While not technically dance, you’ll see this beautiful art performed at clubs and ballets. Forget those boring core workout classes as abs will roll, twist, and shake in this belly dancing class. Crescent Lotus Dance Studio offers various levels of dance classes, from beginner to intermediate, and even has performance opportunities for those who want to show off their newfound talent. For those looking for a unique bachelorette party, take the crew for a private dance class. If you’ve always wanted to move like a dancer in a music video, join Passion Dance Center for Hip-Hop Tuesdays at 8pm. Under the tutelage of NOLA local Tamika Jett, who has been credited in videos by Beyoncé, Missy Elliott, Solange, Big Freedia, and many more, dancers will slay. There are even opportunities to live out your performer dreams as part of a production, music video, or stage show. Cost: $5 on Sun, Free on Wed.
New Orleans has a vibrant Latin community that blends beautifully with the city’s colors, food, music, and dance. Bookoo Rueda is a center that celebrates Cuban music and dance -- salsa, danzón, mambo, chacha -- while mixing in New Orleans dances in like zydeco, bounce, and hip-hop. Classes focus on skills and turns that apply to social dancing with a partner, as well as dancing Rueda de Casino as a group. Ever dreamed of dancing like a Bollywood star? That dream is only an eight-count away, with Masala Bhangra classes. Learn all those awesome moves while listening to heart-pumping Bollywood music. If you’re in the mood for Indian food after you’ve worked up a sweat, head to Silk Road in the Marigny for global specialities vegetarians love. Madina Papadopoulos is a freelance writer and author that splits her time between New York City and New Orleans. Her lifestyle articles have appeared in Paste Magazine, Cosmopolitan.com, Delta Sky Mag, and The Village Voice, to name a few. Follow her on Twitter @madinapaola and Instagram, @IThinkThereforeIEat.